Hello! Today I have a easy and delicious recipe. 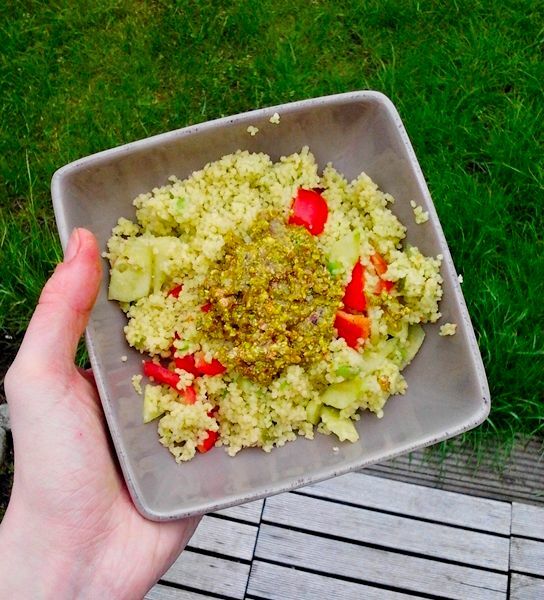 Namely a couscous salad with pistachio pesto. The pistachio pesto is well a time consuming thing to do. But you don’t shall regret it. It’s just delicious, and I definitively going to make it more. Because I love the taste of pistachio pesto. If you don’t like pistachio, then can you always make the classic version of pesto. But when you love the taste of pistachio… That you probably going to love this recipe! 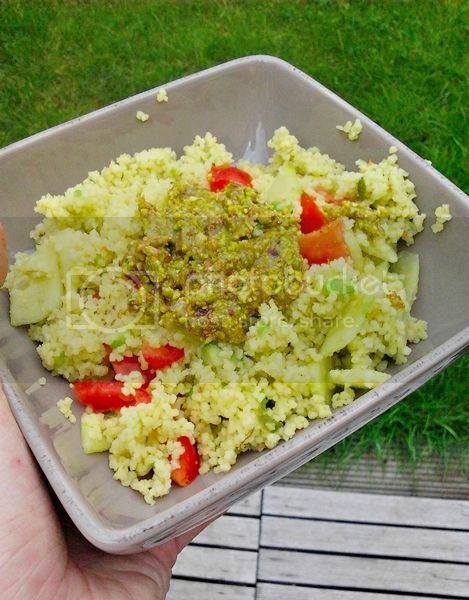 What do you need for this couscous salad for two person? * For the pistachio pesto you need 15 fresh basil leaves, 100g pistachio, oil of olives and some parmazaan cheese. And this all you blend it together with a blender. First of all you do hot water by the couscous. Than you flat the avocado and you mix this together with the couscous. After this you add the cutted cucumber and tomatoes. And you finish it with a few leppels of the pistachio pesto.